You can find your Hardiness Zone by using our interactive map. We accept all major credit cards, debit cards and Paypal. Visa, Mastercard, Discover, and American Express. Over $100 dollars is FREE! Unlike our competitors, we do not charge shipping and handling for the majority of our orders. We’ve made this one of our core principles when we started this business. Under $100 dollars, the shipping charge is $17.95. Absolutely! In fact, you’re not alone – a good number of our customers are shopping for gifts for others. Our sales representatives can even include a complimentary gift card or a message in the box. Please check out our interactive zone map to determine the best tree to gift someone depending on which state they live. Are there discounts for bulk and wholesale orders? Yes! Each of our products clearly lists the quantity discounts that we offer. If your order will greatly exceed the amount of trees listed in the highest quantity discount, please contact a customer service representative to receive a quote on your bulk order. We list an estimated shipping date for every product we sell and we try to stick to that schedule as closely as we can. Over 90% of our orders ship within 1-2 business days (with some shipping immediately the same day) from the date of purchase. Some trees and shrubs that we sell are seasonal and will be listed as such on their product page. These seasonal items may only ship in the spring or fall and will be duly noted. If you order more than one plant, your may receive multiple packages. This is to protect the trees as best as possible as well as getting your order to you as soon as possible. We will always work hard to ship your order as fast as we can but are some time limited to unforeseen circumstances such as inclement and unpredictable weather. We appreciate your patience and will work our hardest to ship your order in a timely fashion. 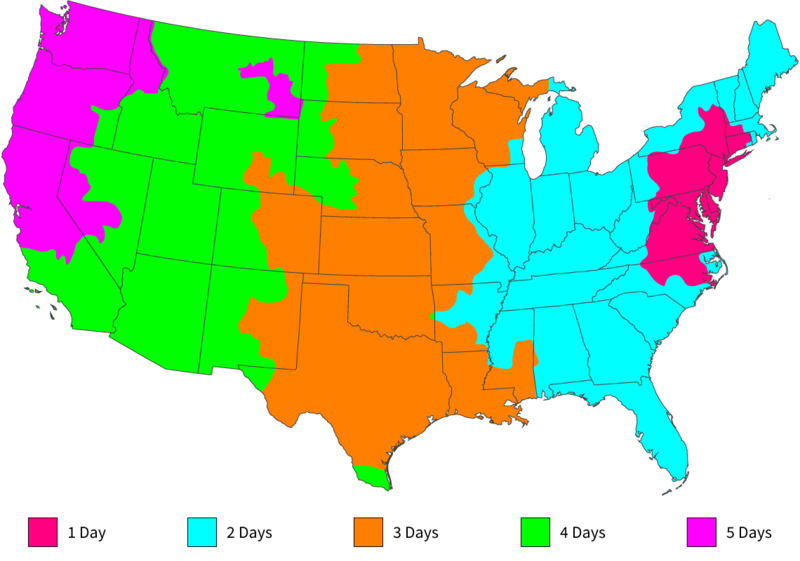 The map below shows the average days in transit a tree will have when leaving our facility in Maryland. We’ve been doing this for a long time and have perfected our shipping processes to ensure your tree does not sit in a warehouse over the weekend. West coast orders will ship on Sunday or Monday, then move further East throughout the week. This method ensures that you will receive your order before the weekend. Each product will have its estimated ship date listed underneath the price. On some occasions, you will come across a product that does not ship until the spring or the fall. This is to ensure that we ourselves get the healthiest plants possible to ship to you. In the event of severe weather forecasts (on our end or yours) we may delay shipping to guarantee your box and tree are not damaged during transit or to avoid unnecessary hold times in a FedEx warehouse. You will receive an email immediately when your order has shipped. In this email we will include your FedEx tracking number so you can track your trees progress as it moves across the United States. To keep our prices low, we’ve streamlined our business around the internet. This means we will be in constant contact with you, every step of the way. You’ll receive emails from us confirming your order has placed, shipment confirmations, and any other information that we deem relevant to your order. Can I delay the shipping of my order? Absolutely! In fact, this is a fairly regular occurrence here. Since we’re shipping a living organism, we want to make sure you get it planted as soon as it arrives. If you need to delay your shipment to ensure that you’ll be home and available to plant your trees, we definitely want to accommodate you because we want your trees to survive as much as you do! To delay the shipping of your order, please contact our customer service department before your order has shipped. All orders cancelled beyond one hour from the time of order placement are subject to a 10% fee to cover our packaging, labor, and inventory expenses. Is there a fee for cancellations? Unfortunately, there is a 10% cancellation fee with a minimum of a $10 dollar charge. Immediately after you place your order, we move your tree to staging. Your tree gets pruned and well-watered for its journey. We also contact our supplier to replace the stock that we’ve sold you. All of this usually happens within hours of placing your order. The cancellation fee is to cover the labor that went into processing your order. However, there is no fee to delay your shipment. If delaying your shipment would be helpful, simply contact our customer service department. My tree just arrived. What is the proper way to plant it? We provide a detailed planting guide with every tree we sell. It is emailed to you once your tree has shipped. Please check your email account to make sure you didn’t miss this detailed, tree-specific planting guide. If you still need information planting your tree, visit our website HowToPlantMyTree.com for an in depth guide to planting trees, shrubs and bushes. I’ve planted my tree, does it need to be staked? This is something that we normally recommend for all trees once they are planted. Staking usually can do no harm to your tree so we suggest staking your tree for its first year while it takes hold and develops a solid root system. You can also consult the planting guide that was emailed to you, or visit HowToPlantMyTree.com. Why are the leaves on my tree turning yellow? In the majority of cases, yellow leaves are an indication of too much water. This can be caused by too much rain or too much watering. Also be sure to check the draining around your tree. If your tree is planted in a low-lying area or if it is in a pot with inadequate drainage, this can also lead to yellow leaves. Why are the leaves curling and turning brown? Brown leaves are usually the opposite of yellow leaves and typically is a sign of not enough water. Be sure to ensure that the soil beneath your tree is not draining too quickly. When the soil is draining too fast, the root system does not receive the proper amount of moisture that it needs. Also, be sure to check that your tree is not planted on too steep of a slope – this can cause the water to runoff and drain quickly instead of soaking down into the root system. I think my tree has a pest or fungus, what do I do? The best thing to do is contact your local agricultural agency at their extension to inquire if there is an issue in your region. Every tree that The Tree Center sells is quarantined and inspected once we receive it. It also undergoes a final inspection before we send it out the door to guarantee your plant is free of pests or fungus. My question or problem is not listed here. For more detailed information contact your local USDA agricultural agency at their proper extension. You can find this information at the USDA’s website: https://www.usda.gov. My tree/shrubs were wilted on arrival. We have gone through great lengths to package your tree with care. But nonetheless, your tree has been in a dark box for a few days without sunlight. It has likely been handled roughly by mail carriers and could possibly have been exposed to harsh temperatures. Although your tree has been well-watered prior to shipment, it may look a little wilted and/or dry; this is not entirely uncommon and is no cause for alarm. All your tree needs is a little water, and some exposure to sunlight. Although trees are delicate organisms, they’re also very resilient and can survive a lot of punishment. Once they get established and settled in their new home, they perk up quickly and return to a healthy, happy state. We work hard to ensure order accuracy. But in the rare event that you receive an incorrect item, simply call our customer service department so that we may quickly resolve your issue as fast as possible. My trees are the wrong size. If you received the wrong size plant we would like to get this rectified as quickly as possible. Please email us a photo of your tree or shrub next to a measuring device (measuring tape or yard stick) that clearly shows the entire tree from the bottom of the container to the tip of the plant so that we may process your request. Please note that our measurements are from the top of the root ball to the top of the plant. Unlike other tree companies, we do not include the root system or the pot in our height measurements. That is a deceiving tactic that we do no adhere to. We are very sorry to hear that. Although we attempt to limit this, sometimes this can occur. Please view our Arrive Alive Guarantee so that you may review your options. If you think that your tree or shrub has a pest or a fungus we recommend treating it with an appropriate pesticide or fungicide. If you are unsure what product to use, please contact your local USDA agricultural agency (http://www.csrees.usda.gov/Extension/) so that they may assist you in diagnosing your problem. Unfortunately, we do not have a traditional paper catalog. Our website is constantly being changed and updated daily with stock changes, product information, and a plethora of other content. In order to keep everything up to date, we provide all of our information online. Not only does this keep our website updated in realtime but we also save thousands of pounds of paper each year by doing business strictly online. If you have any questions regarding our products, do not hesitate to contact our Customer Service Representatives. If you need more help, please contact our Customer Service Department. A willing and able representative is available to answer any question you may have. After you order is shipped, you will receive an email with detailed planting instructions that are specific to the tree or shrub that you ordered. If you need more information, please visit our Planting Guide. Most people don’t know this, but the USDA is available to help with almost any plant/agricultural question you may have. The Cooperative Extension System is a nationwide, non-credit educational network. Each U.S. state and territory has a state office at its land-grant university and a network of local or regional offices. These offices are staffed by one or more experts who provide useful, practical, and research-based information to agricultural producers, small business owners, youth, consumers, and others in rural areas and communities of all sizes. Please visit http://www.csrees.usda.gov/Extension/ for more information. We believe that we have the best guarantee in the industry. We care about every tree that we ship and we’re passionate about trees and the environment. We care so much that we’ve put together a guarantee that no other company can match. We guarantee that every tree, shrub or bush that we ship will arrive to you in excellent health. Orders may be edited within an hour of purchase. Any edits after one hour can only be made at our discretion and if the process of order preparation has not begun. In the case of an order change after one hour, and/or if we have started processing and/or shipped your order, a 20% fee will be applied. This fee is in place to cover our labor, inventory, shipping, and packaging expenses. Shipping plants is a very intensive process, and re-routing or cancelling shipments is both time and cost intensive.